Everything you need to know about this Loo Love is explained in the sweet flyer below. A dear friend passed this along to me yesterday and I couldn't help but get excited about this initiative and share! I LOVE, LOVE, LOVE shopping my hometown - for so many reasons - and not just because I live in the heart of it all. There is such great variety in Shelbyville - great people - great customer service. I can walk to Sixth & Main Coffee Shop and Pen calls out my usual drink order and chats about photography with me for a few minutes. A quick trip to Through the Looking Glass and Regan not only offers me my favorite tea when I walk in, but briefs me on what is new in the store and which flavors of cake are in. I can see handmade goods from one of my favorite crafters, Debbie Hembree, and catch up with great friends - there is always someone I know inside. Just a few feet further and I can drop in Weeds and Things, where Rob and Chris outfit me with great florals for the studio and keep me informed me on the latest bags in brown and blue or the newest doggie goods for Leila Loo. Just down the street at CJ's Candies, I stop in way too often for mint oreo truffles after meeting friends for lunch at sweet McKinley's Bread Shop. Maggie's Bistro 535 knows buffalo chicken wraps are my favorite - and that I drink the tea like a camel....love that! I also adore the sweet antique stores - I'm always hunting up blue mason jars and sweet props for senior sessions. Harriet at The Needle Nest has a crazy talent for getting me to needlepoint - she has a plethora of designs and needle-related craft supplies. Just accross from her is Making Ends Meet, where women come in droves from near and far to purchase fabrics for their homes. Take a step into my office and you will see both my unfinished needlepoint and my new valance covered by Making Ends Meet. I know I have left many of our great stores out, but I hope you get the idea, that this sweet downtown area we have is made possible by great stores who enjoy providing great service to our community. 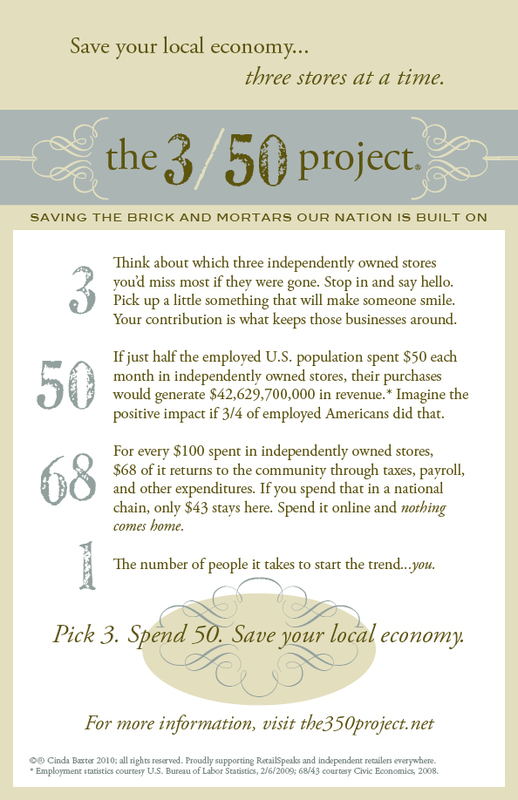 Read the flyer below, pick your favorite 3 and hit the streets with your 50! Do it. You know you need an excuse to shop!! Further opportunities for help include visiting their Valentine Campaign by clicking here. You will download a PDF valentine, print it out and mail it in to your favorite morning news program - and the addresses are even included (Genious!!). I would LOVE to see this spread like wildfire, so take a minute and print it out, fold it up and drop it in a mailbox - it would be great to see the project featured on our favorite national news shows!! I would also like to give mad props to this girl who went on 31 dates in 31 days last year and found the love of her life - crazy right? I NEED you to check it out - she blogged the whole thing and is now writing a book about it. Thanks to my bestie, Allie, for sending this my way! Last love for the day..I think! Tres Chic Shelbyville was a wonderful event! Pictures from the event can be seen and purchased here!